By Susan Waughtal on February 12, 2011 Visit Susan's Website. It’s our second year raising chickens in Minnesota and I have figured out a few strategies to make chicken care during the frigid winter a little bit easier. When it rarely gets above freezing, the biggest challenge is providing water for livestock. In the summer, I use both metal and plastic poultry founts for watering my chickens. I have used the heater bases that go underneath the metal founts to keep the water from freezing, but they only prevent freezing at temperatures down to +10 F. It is typically colder than that here in the winter, even inside the coop. Every morning, I had to haul the frozen metal water fount into the house and thaw it out under hot running water to be able to get it apart and refill it. So annoying! Then, I discovered heated buckets available in the horse department of my farm supply store. Not only are they much easier to refill and clean, they are less costly (I got one on sale for $20) and they are effective to a colder temperature. Even when our temps drop to 20 degrees below zero, the water in the heated bucket has not frozen. 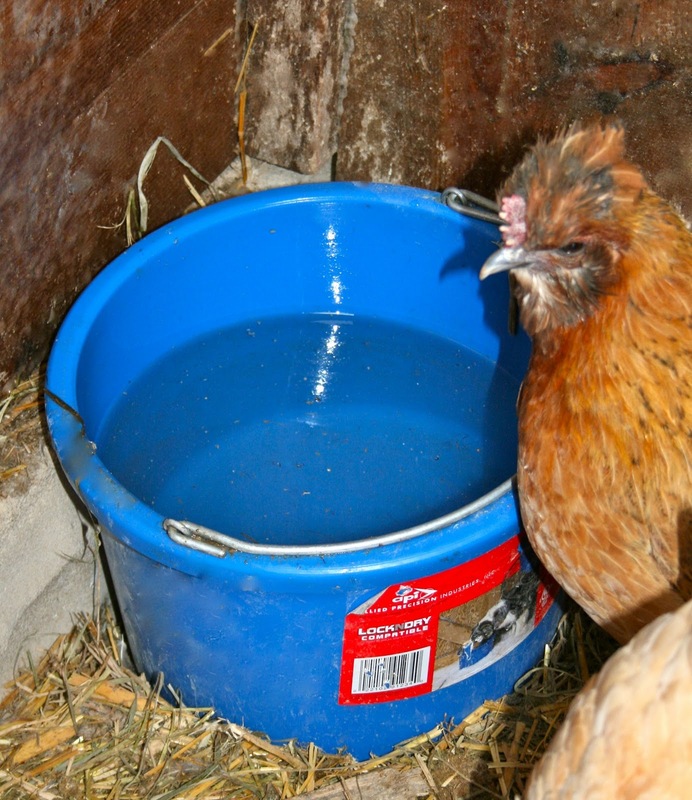 I would not use an open bucket like this with very young chicks that could fall in and drown, but the adult chickens seem very happy with it. My kids teased me when I bought a child’s plastic toboggan at a garage sale last summer, but it has proven to be my most valuable winter tool. 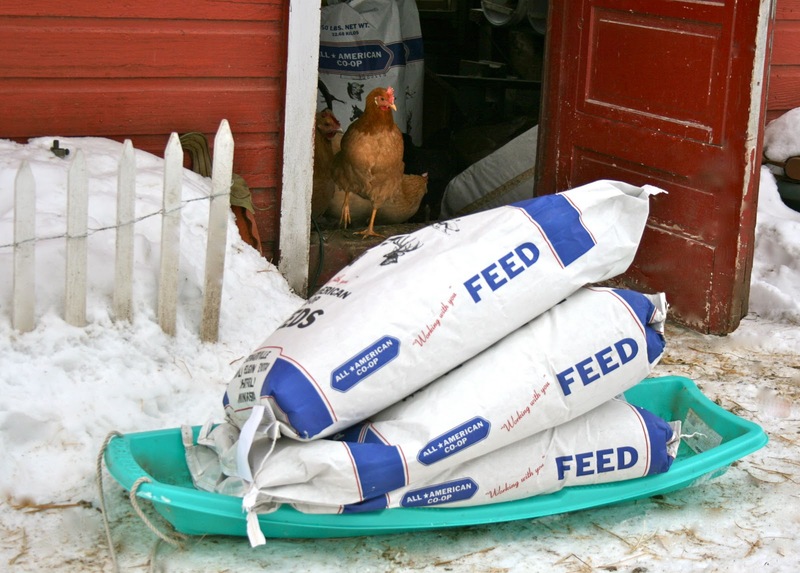 I can haul 4 50-lb bags of feed effortlessly from car to coop to barn on the sled — saving my back and many trips in the cold. When my outdoor faucet froze up, it was a dream to haul 2 5-gallon buckets of water at a time, virtually slosh-free, to the cows and chickens on the sled. Last weekend, I filled up garbage bags with the dirtiest of the chicken bedding and hauled it via the sled to the compost pile. I also use it to move bales of hay for the cows and to haul large bags of wild bird seed to refill the birdfeeders around the yard. My back loves this sled. You may have noticed the generic feed bags in the photograph. I discovered that I can purchase all types of chicken feed, game bird feed for my guineas and corn at the nearby farmers’ cooperative grain elevator. It costs about 20% less than buying commercial feed at the store, they load it into my vehicle (saving my back) and all of the grain has been grown by farmers from within a 40-mile radius. I try to eat local — I am delighted that my chickens can, too! An added benefit is that the feed bags are made from paper rather than plastic. This spring, I will open them up and lay them out on the soil beneath a layer of straw as a biodegradable weed-barrier and moisture-retaining mulch for my tomato and raspberry beds. No waste! Any of the hand-crocheted pieces by Aunt Marty Made It are great for adults with a sense of humor, with those who have kids or grandkids or nieces and nephews, and with those who are tired of cold noses, because its humor is matched only by its usefulness! Aunt Marty makes a lot of other designs, and can probably dream up something unique if you just ask! She designed this adorable chicken nose warmer that you could win! Or buy one now as a stocking stuffer that will make your loved ones smile. Hurry, entry ends Sunday, December 14, 2014. Great idea, Trefoil – I am going to try that! Another tip for wintering poultry. I buy alfalfa cubes, add hot water to disintegrate them into a “mash”. My turkeys, guineas, chickens, geese , and ducks all Love it. I’ve used the sleds, too, but that heated bucket looks like just what I need for next winter! I frequently use a plastic sled to move 50# bags of rabbit food and bales of hay. Works well for fire wood too. I have a heated waterer which has its drawbacks such as spillage. I will get buckets another winter. Great post, thanks for the ideas! !